It seems a strange time for Tottenham Hotspur Football Club to be building a new stadium. However, the depths of recession clearly pale into insignificance when you’re riding high in 4th place in the Premier League. 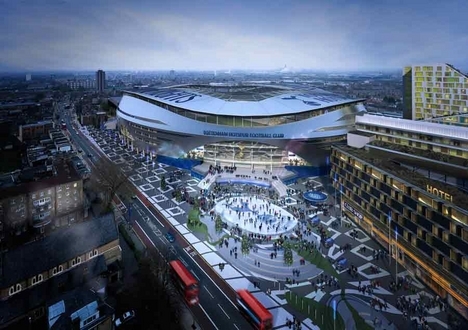 The main opposition arrises in that the new stadium in Harringey, London would sit on 15 historically listed buildings. 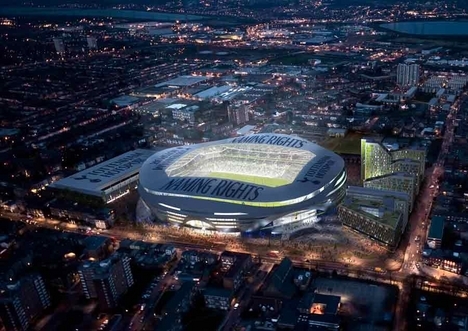 Spurs are arguing that their 434 new homes, club museum and adjacent hotel will more than compensate the local population but complaints have already been made by Save Britain’s Heritage who have drawn up their alternative vision of the site. Grade II listed buildings can currently only be altered under strict planning restraints so it will be interesting to see how this scheme fares at the planning stage over the next few weeks. I can’t see it sailing through but maybe the roof’s “NAMING RIGHTS” should read “WATCH THIS SPACE”.